We have soybeans in all different growth stages but the majority of the crop looks great but there are a few highlights based on some scouting and reports from last week. 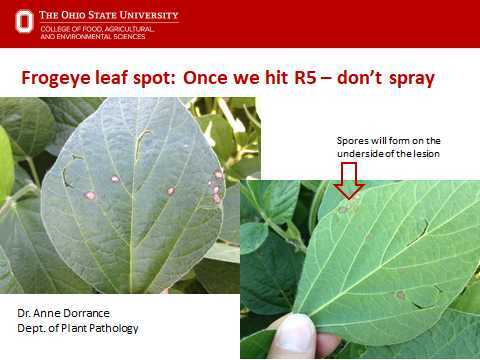 Last week, samples of frogeye leaf spot of soybean were brought into the lab. On the underside of the characteristic lesion were the conidia. This came from an area where the incidence of frogeye was notable at the end of the season. For the 2018 season a susceptible variety was planted back into that same field. Environmental conditions have been favorable for this disease to begin in some areas of the state. Managing Soybean Rust, Bulletin SR2008. Publication covers specifics of soybean rust identification and management. General section of the publication cover the use of fungicide sin general for disease control including description of products and their activity, application information and modes of action.